Manhattan-based Silverback Development has acquired for $12.4 million a two-building office complex at 1111-1177 Summer St., in the outer circle of downtown Stamford, following up its 2016 acquisition of a trio of neighboring office blocks. 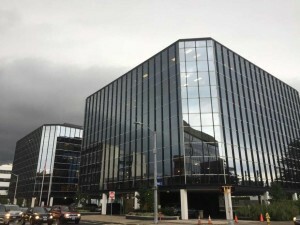 The two-building office complex at 1111-1177 Summer St., in Stamford, Conn., has sold for $12.5 million to Manhattan-based Silverback Development. The purchase price compares with an appraisal last year of about $21 million for a 50 percent-occupied property. The acquisition of the two six-story towers — which together cover approximately 128,000 square feet — increases Silverback’s downtown portfolio to five buildings. “We believe Stamford is one of the most promising resurgent real estate markets in the tristate area right now, as evidenced by the influx of millennials, real estate, health care and tech companies flocking to the area,” Alan Glick, Silverback’s vice president of development, said in a statement. Silverback officials said they aimed to raise 1111-1177 Summer’s occupancy rate to 100 percent during the next year. They cited as incentives to potential tenants the property’s proximity to I-95, the Merritt Parkway and the downtown Metro-North station; flexible office layouts allowed by its column-less floor plates; and amenities including covered parking, security and concierge services. Spanning a full block, the 1.58-acre site recently underwent a $2 million renovation in both buildings, a project that included refurbished lobbies, hallways and public spaces, according to Silverback officials. In late 2016, Silverback acquired the office buildings at 733 and 777 Summer St., and 612 Bedford St., for a combined $12.5 million. This year, the sale of the Element One apartment building, at 111 Morgan St., on the edge of the downtown, ranks as the city’s largest property sale. Other major deals in recent months include the $42 million sale of the Park Square West apartment building at 101 Summer St., and the $25.5 million sale of the Pine Hill apartments at 112-120 Strawberry Hill Ave.